Setting up your DD-WRT router to connect to My Private Network’s VPN should take just a few minutes using our OpenVPN application. Our app connects to the VPN via the SSL protocol. Please note that your DD-WRT router needs to be connected to the Internet and devices connected to it are able to browse the web before moving on with the instructions below. Make sure your router is connected to the internet and that you are able to browse the web. To check your location, please go to our IP Info page. You will presumably have the WAN or Internet port of the DD-WRT connected to the LAN or Local port of your primary router. You might want to configure the wireless network of the DD-WRT to be something with VPN Country in the name i.e. MPN GBR, MPN USA so you can tell which is which, but all of that is up to you. You can check this by clicking on the Services Tab and then VPN, it should show you options for OpenVPN setup. If it does not, you do not have the VPN version loaded, please either load the VPN version or contact us for further guidance. Note: Although you can setup OpenVPN using the web interface, this is not compatible with our service, so you need to actually upload the connection script. To do this, go to Administration > Command and enter this line below into the Command shell. Login to the router administration interface and go to Setup > Basic Setup. Scroll down and click on Network Setup. Once logged in, go to Setup > Basic Setup. Scroll down and click on Network Setup. Note: These are Google DNS servers and we suggest using them. Note: If your primary router is running on 192.168.1.1, you will need to change the DDWRT router’s IP address to 192.168.2.1 so they don’t conflict with each other. 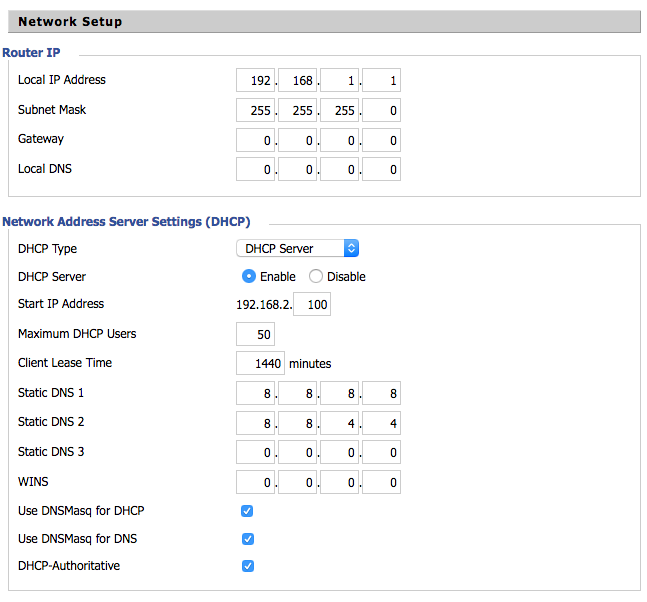 You can do the changes at the Local IP address option under Network setup. Don’t worry about any other information in this image, it may not be the same for your router or setup. Go to Services > Services, scroll down to System Log and enable Syslogd. This will provide us with some logging info if there are any problems. Once you’ve entered the command above, click on Save Firewall. Note: If you wish to use our Free service, the COUNTRY that you need to use is fre and your connection will be rotated between different countries we have in our Free VPN cluster. To connect to any of our other servers, (ie. our USA servers) simply change the COUNTRY to reflect another location. For a list of server names, please refer to our complete list of servers here. Once the router is back online, it should be connected to our VPN servers automatically and anything using it will be routed through our service.